Homemade Coffee Ice Cream is a simple, uncooked recipe for ice cream flavored with instant espresso. 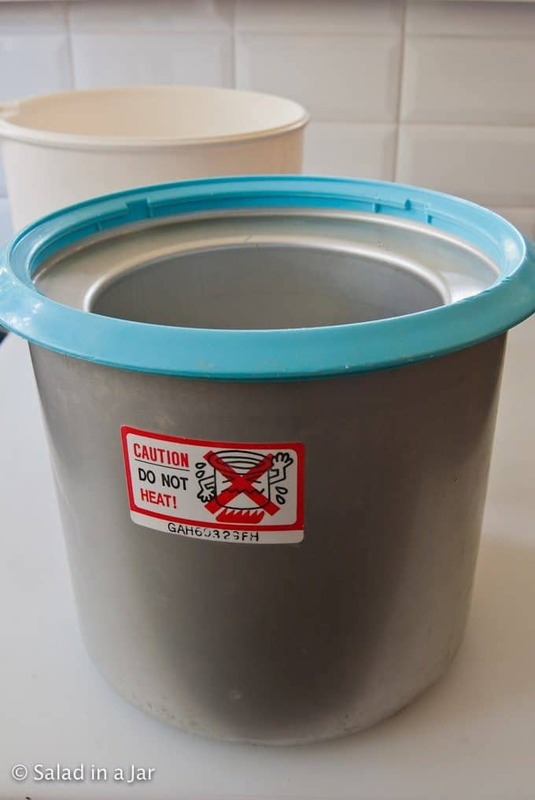 It’s written for a small quart-size ice cream freezer. Keep reading to find out how and why I can make this in the car on the way to a party. My favorite ice cream maker is a Donvier. Have you seen one? 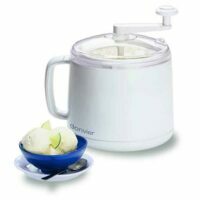 A Donvier Manual Ice Cream Maker is non-electric, which makes it portable. 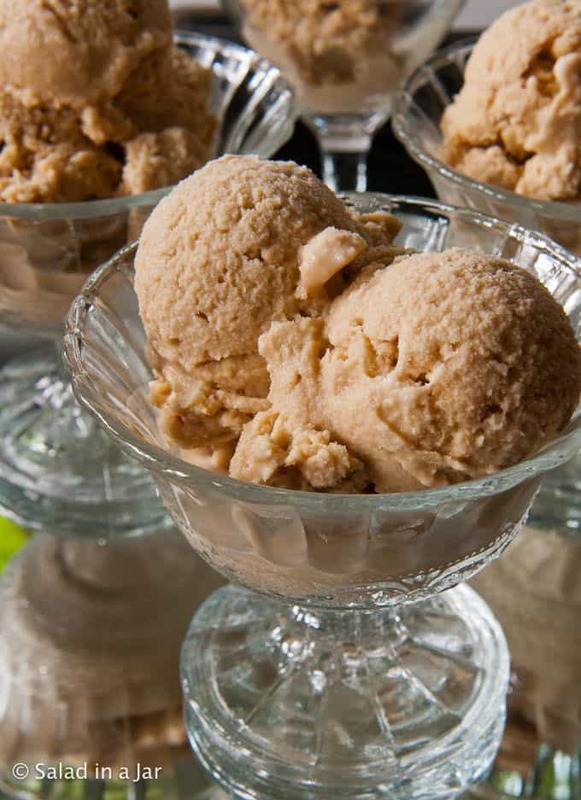 Yes, that’s why I’ve been known to churn ice cream in the car on the way to a party. Although it won’t have the opportunity to harden like normal in the freezer for a few hours, soft-serve is still mighty delicious. 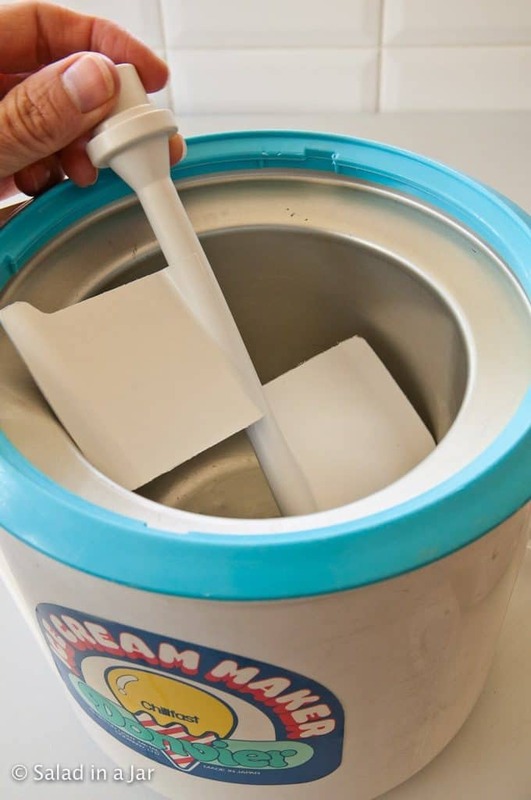 Store the inner liner in your freezer or place it in your freezer for a minimum of 12 hours. Insert the paddle and pour in chilled ice cream mixture. Put the lid on and turn the paddle. Want to see a Donvier in action? You can see Martha Stewart demonstrating one here. I won’t blame you if you think it’s too much trouble to sit for 30 minutes and turn the paddle. But it’s not like that. 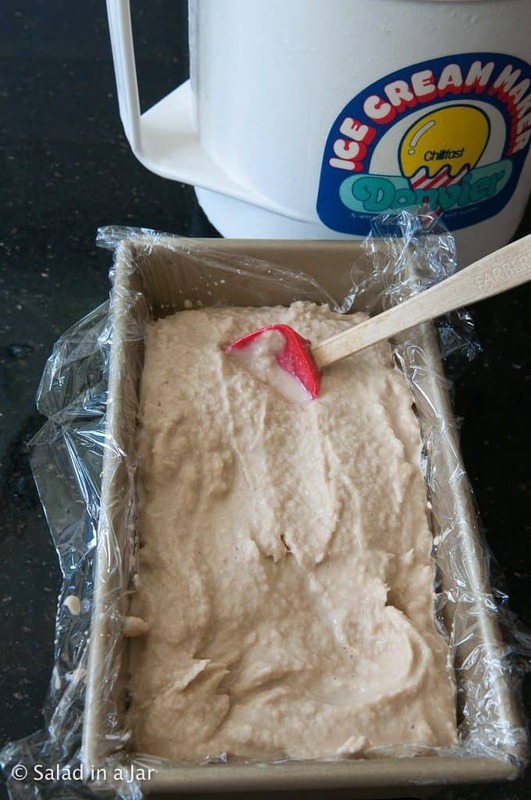 You only need to give the ice cream a couple of turns every 3 or 4 minutes in the beginning. 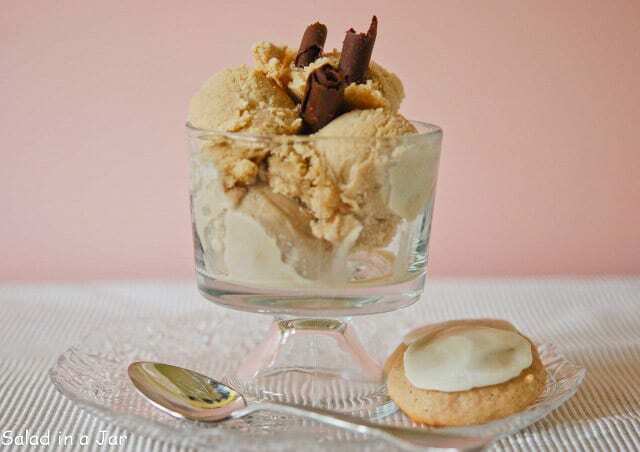 As the ice cream gets hard, you’ll need to turn it less and less–like once in 10 minutes. Typically, I start my ice cream and then proceed with another task in the kitchen, stopping once in a while to give it a turn. I’ve even carried it to my laundry room or upstairs to my desk where I turn it periodically while working. Moreover, it’s a great job for children. They really can’t mess it up. Coffee is my favorite ice cream flavor. However, if you don’t share my passion, leave the coffee out for a tasty vanilla ice cream. Simply add a teaspoon or two of vanilla extract. It’s also delicious with chopped fresh fruit or chocolate chips. 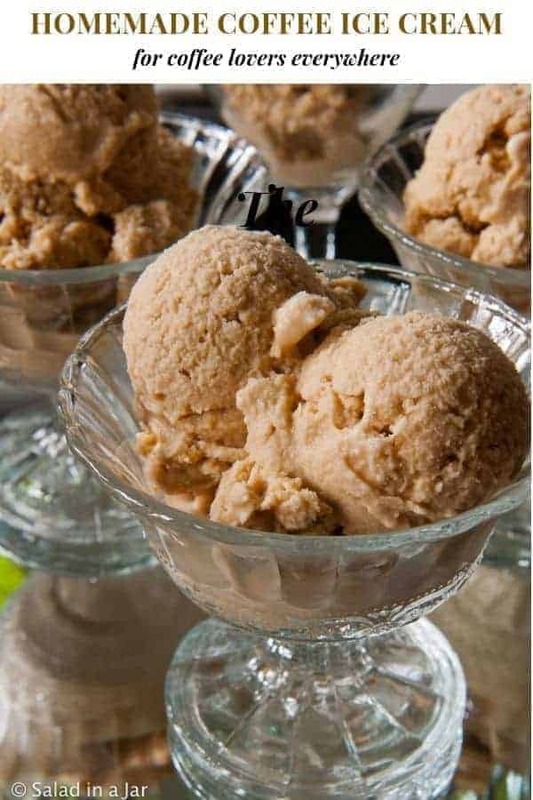 Adapted from the Sweet Cream Base recipe published in Ben & Jerry’s Homemade Ice Cream & Dessert Book. Blend eggs and sugar in a medium mixing bowl. Whisk in salt, milk, cream, and instant espresso. Chill overnight if you have time. If not, go to the next step. Add vodka, if using. 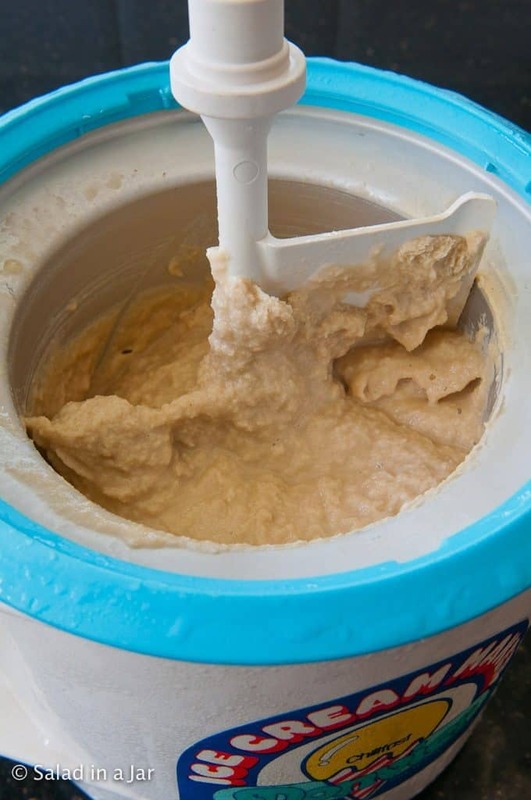 Pour into ice cream maker and freeze. 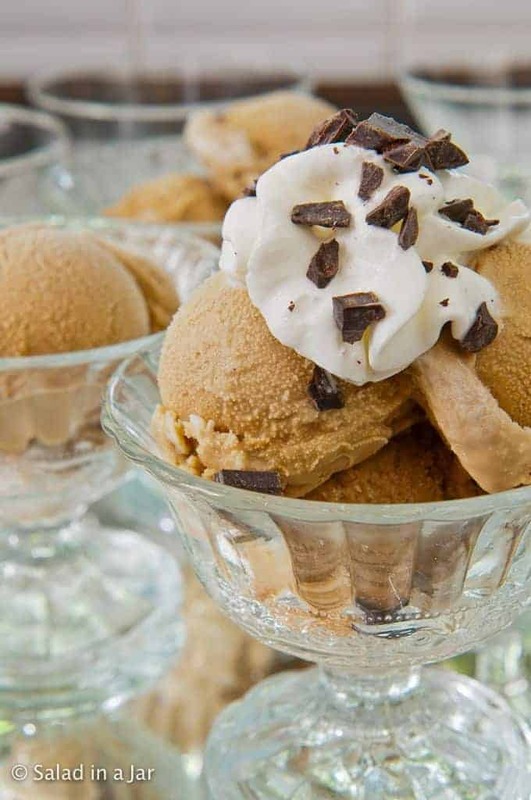 If left in the freezer over 24 hrs, ice cream may become hard and difficult to dip. Let it sit on the counter for a few minutes to soften. If you need or want to avoid raw eggs, you might consider using a different recipe. Looking for a "lighter recipe"? Use 2 cups of milk and 1 cup cream instead of 1 cup of milk and 2 cups cream. I do it all the time, and it goes down just as easily. Having said that, it's not quite as rich and creamy as the original. This post was originally published on Salad in a Jar in August 2009. Oh my, so many amazing foods here. I really wish I wasn’t stuck in freezing winter temperatures right now because I want to eat them all. This looks delicious, Paula. I think mine will require a few shavings of dark chocolate over the top. Thanks for sharing the recipe. I am with you on the chocolate! Love the nutritional stats. Keep them coming. btw…..I have had salad every day for 2 weeks. Best thing that has ever happened to lunch for me. Scooter, So cool about the salad. Keep changing it up so you don’t get tired of it. I DO get tired of preparing it (so I try to do it first thing on Saturday morning when I have lots of energy) but I never get tired of eating it. I always have a little something (as in 1/4 cup portion) I really like to go with it–usually some kind of leftover veggie or entree from the night before. LOL, I’m laughing about the part where you sometimes churn ice cream on the way to a party. At least it’s fresh that way! Now isn’t your post timely! 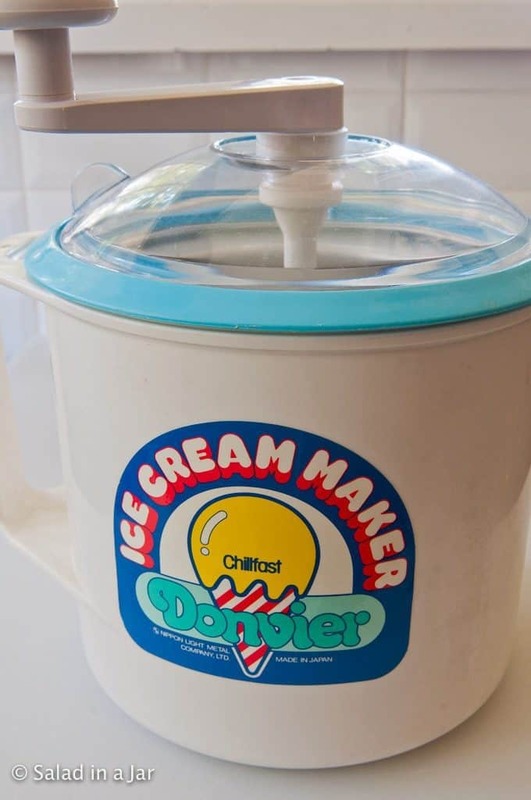 I happen to have one of these that used to belong to my parents.. and it has just been sitting there.. waiting for me to make Coffee Ice Cream. This looks fantastic… and I just love your site! This looks great- I’ll have to try it!! I can attest to those cookies, I’ve made them twice since you shared the recipe, each time they’re gone in one sitting with friends!!! Thanks for sharing such GREAT recipes!!! 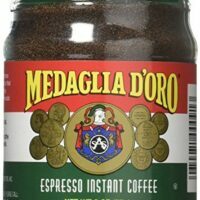 I’m not a coffee fan, but my husband (Joey) would love this! I’ve not seen those ice cream makers…must check them out! I like your layout too… I’m new to wordpress, was on blogger for almost 5 years. I like wordpress much better so far but I’m getting used to it also! Have a good day Paula!